I know that all dwarf angels have a tendency to nip but I am sure there are certain breeds that are more likly to nip than others. So please share your experiences with the dwarfs you kept. I like the potters angel but I don't have much info about it, how likly is this guy to nip? We have a coral beauty. A little bossy with the tank mates, but not too bad. Just has to be the king. Leaves all of our corals (SPS/LPS/softies) and clams alone. But it is well fed - I've been told that is important. First, I would not suggest a potters as your first angel. I keep a lemonpeel, I have seen it nip at an SPS once. And that was the end of it. IME it is always a 50/50 toss up with any Centropyge. I have had a CB, Lemonpeel, and a Flame. Also, keeping them well fed as said above is a good thing. IME this has kept my angel's from nipping. And I have one notorious for nipping. I always have a sheet of seaweed on a rock and I feed mysis once a day. 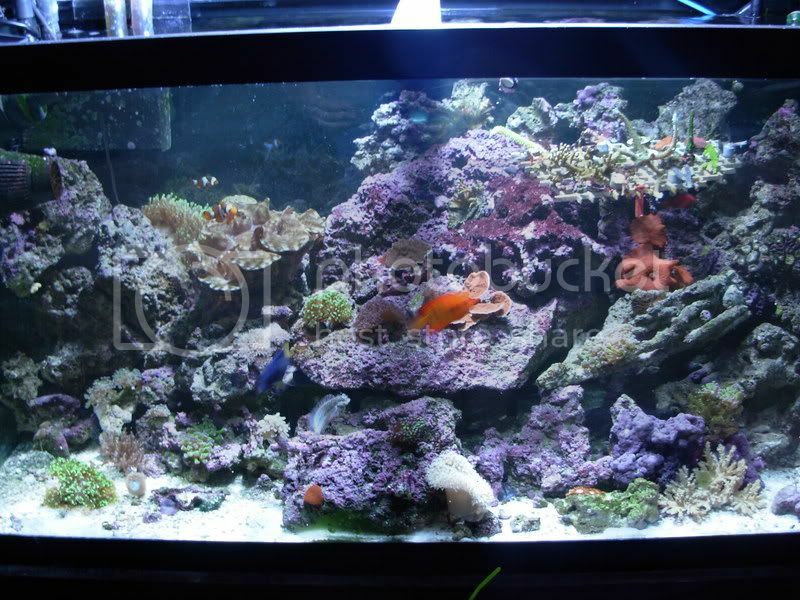 Livestock: A. Ocellaris Mated Pair, Six Line Wrasse, Lemonpeel Angel, Fiji Golden Sailfin Blenny, Purple Firefish Mated Pair. I went back and read nearly every post about dwarf angels for the past year. From those readings, I've concluded the pygmy angel (Cherub) and it's close "cousins" the Flameback Angels are the most reef safe. However, it should be said that NOTHING is 100%. I went out and bought a pair of Flamebacks. It's only been a week, but so far, so good. Location: Carlsbad, New Mexico Down In The Desert!! 15 Gallon Nano, 80 Watt Current USA PC Light, 15 LBS Live Rock, Pair of Clowns female ocellaris male true purcula!! 100 Gallon 100Lbs L/R, 100lbs L/S, Tek Limited Edition 6 Bulb!! I have a tank with a few SPS corals, some xenia, and some zoanthids. My flame angel was great for almost 6 months, but the little jerk has just now started harassing my pink zoanthids. He will not let them stay open. For the longest time I thought I had a "good one." I always knew, however, that I could never get a clam in the tank with the flame in there, as he loves to pick at the base of the snails just to get a reaction. They are beautiful, but if you don't want to worry about your corals - or you want a clam - I personally would avoid one. Just my experience! Forgot to mention - as far as I can tell, my flame angel hasn't bothered my SPS - yet! But I am watching him closely! I've got an SPS dominated tank with 2 dwarfs. 1 Coral Beauty and 1 Rusty Angel. They've both been great. I see then nip algae all day, but never an SPS coral or clam. I've had my Dejardini sailfin eat clams before, but the angels won't even look twice at a clam. They don't really directly attack nori either, just eat whatever is on rocks or floating around. Again, I've got more problems between my Dejardini (who I keep because he eats ALL ALGAE! including bubble, GHA, bryopsis, etc) and my Christmas Wrasse who eats snails, so i don't really worry about the two dwarfs. I have had good luck with C. multicolor in both SPS and LPS tanks. I have had good luck with C. joculator in an LPS tank. I had to trade in my Coral Beauty. Soon as I added a Tubs birdsnest he started to nip. Sure success with a reef safe angel is to go with one of the Genicanthus species. I have a female Bellus and she is active, beautiful, non-aggressive, and never approaches any of the corals, hard or soft. C. argi & its relatives ( Cherubs & Flamebacks), Also White-tailed & Fisher's are the best bets. But of course, there is always some risks.. In the past I've had 4 flame angels they all lasted 1 month then all of a sudden lost their color and died 2 days later, I had a 1/2 black, that lasted 2 weeks, then a coral beauty that lasted 3 days, an eibli that lasted about 1 week......... great luck right? Then I had a Mac certified Potter's, who was doing great, until I had a power outtage that killed him, my prized Achilles, and a naso tang. Then I get to my current Potter's, had him for like 5 months and he's doing great........ ok enough jibber jabber, he nips here and there at my sps, but nothing major, I watch him all the time he doesn't even look at my clams, he pays more attention to the kole tang I have, they take turns chasing each other. I've had a Potter's for about a year now and it doesn't bother any of my corals or clam. It does like to try and boss around the Red Spotted Blenny and Brown Barred Goby. It is well fed with nori, flake and frozen foods.